Knights, being both career soldiers and nobility, often had access to the best equipment of their age, so it makes sense that a Knight Helmet would be an impressive and highly protective piece of armor that shielded a knights head from all angles. And indeed, this medieval-styled great helm does just that. This knight helmet is a classic great helmet in the truest sense. 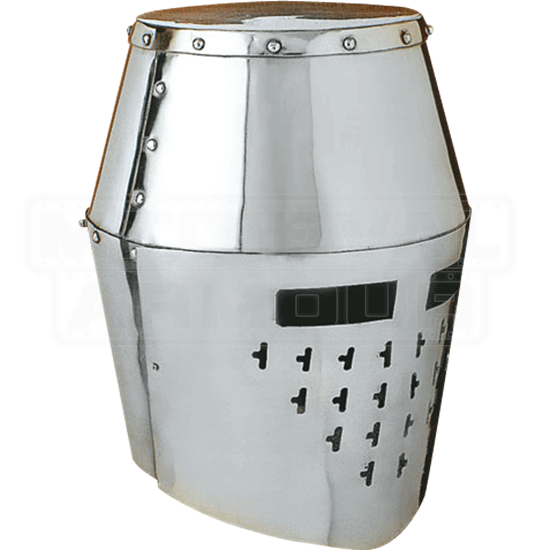 It takes the shape of a cylinder of steel that is bowed sharply around the middle, creating a bit more room on the interior of the helmet. The flattened top is a distinctive design for the great helmet, as are the rectangular eyelets that allow the wearer of the helm to see out. Small cutouts under the eyelets provide additional ventilation to the helmet, ensuring that the wearer does not easily overheat, while also allowing the wearer to breathe easier while wearing the helm. This Knight Helmet will not only make you feel like a knight, but it will also make you look like one, making it the perfect helm to wear when you head into LARP Or reenactment battles, as well as a great display item to include in your own collection.